Sunday, November 11, 2007, we will once again celebrate Veterans Day. This day was set aside initially to honor surviving veterans from World War I, but has been expanded to honor all surviving American veterans from every war. For more information you can find details at these sites, here, here and here and elsewhere on the web. It's my experience that most folks have no clue about Veterans Day, except it sometimes results in them having a three-day weekend. Except for those of us who are veterans, most people don't even give the reason for the "holiday" a second thought, much less fly a flag or attend an event commemorating the day. Many of us are so wrapped up in local issues - saving the critters, weeds and dirt at Fairview Park or fending off efforts of those who plan to "poison us" with fluoride in our water, for example - that we seldom take time to remember the veterans of our wars and their sacrifices for us. 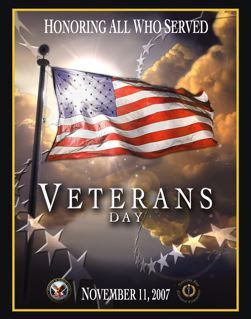 I hope, sometime this weekend, in between football games or after you've dried off from your morning surfing session, you'll take a moment to seek out a veteran of our many conflicts and thank him or her for their sacrifice for our country. Today, with so many brave volunteers serving in hostile places in the Middle East and elsewhere in the world, it is especially important to show your support for their efforts to protect our country through their military service. Regardless of how you might feel about the validity of our presence in Iraq and Afghanistan, the brave men and women who chose to serve this country in dangerous, far away places deserve your respect and support. We live in perilous times - when events even more horrendous than those of September 11, 2001 could happen here on our soil at any time. There are elements in this world who have vowed to exterminate us. What stands between us and more violence here at home is the bravery and vigilance of our men and women in the armed forces and local law enforcement departments. Take some time this weekend to hug a veteran - we deserve it. Last night's Costa Mesa City Council meeting may have been the most surreal event I've observed in nearly a decade of paying attention to what goes on in our city. This meeting, which dragged on past midnight and actually ended at 1:10 this morning, demonstrated the wisdom of the council policy to not try to conduct city business past midnight. 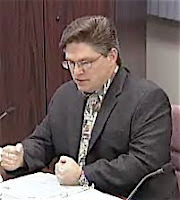 Mayor Mansoor, who looked like he was well off his game all night, made the decision to move forward with one of the most contentious issues on the agenda - the debate of whether or not to re-open the Fairview Park Master Plan to consider placement of a dog park and/or skate park within it's boundaries - at midnight! Dozens of speakers stood to address the issue and very few spoke in favor of such a move. Most pleaded with the council to retain Fairview Park in it's "natural" state, citing potential damage to fragile habitat and danger for the indigenous critters that call it home. This was after the council decided earlier to approve placement of a temporary building near the model trains to house a donated train exhibit and to move forward with plans to seek grants to build a larger building that is included in the current master plan. THANKS, BUT NO THA NKS - WOOF! One of the truly strange parts of the Fairview Park debate was the fact that several dog lovers, including a couple officials from the Costa Mesa Bark Park Foundation that oversees the operation of the TeWinkle Park facility, stood and told the council that the site proposed by staff for a dog park at Fairview Park was not acceptable. They encouraged the council to look for a different venue. I can't remember when an advocacy group rejected an opportunity for a facility before. It was actually kind of funny when former mayor Sandra Genis - a dog lover herself - stood at the podium and warned the council about the inappropriateness of the proposed site, citing the potential danger from errant golf balls from the adjacent golf course. I know she was serious, but I couldn't help but chuckle. Earlier, the subject of a skate park at Lion's Park took three hours to debate. The staff h ad provided the council with five different sites within the boundaries of Lion's Park, including the incendiary suggestion to place it on the infield of the baseball diamond at Davis Field. At the end, none of the sites presented - which represented virtually every inch of open space available at the park and then some - were found to be acceptable. The result, much to the chagrin of the men on the dais, was that the ladies on the council voted to not place a skate park at Lion's Park. They, instead, directed staff to return soon with an analysis of each of the other parks throughout the city with an eye on possibly placing small skate venues in several of them to serve the neighborhood skaters. They also directed staff to continue to seek opportunities to purchase land in the city for another larger skate park. I imagine there's a certain diminutive bar owner who is not happy this morning. The issue of the possibility of closing Park Avenue north of 18th Street, a strange idea proposed by Linda Dixon, was combined for discussion with the skate park at Lion's Park. It was clear from early debate that no one was interested in closing the street - rightfully so. That idea was rejected along with the skate park. 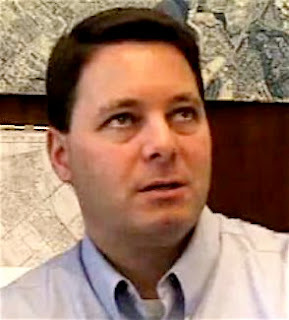 In a night of strange events, the most bizarre was the behavior of Mayor Pro Tem Eric Bever when, at the end of the debate about Lion's Park as a possible site for a skate park - even before the vote was taken - he blew a gasket. He petulantly told his peers on the dais that he was "ashamed to be up there with them" and that they should let him know the next time they planned to discuss a skate park because he would just stay home. I found myself wanting to make him go stand in a corner for his infantile outburst. That display of childishness occurred just before midnight, reinforcing the wisdom of closing the meetings before the calendar flips over. Curiously, a man who has been beyond just merely vocal on the subject of the preservation of Fairview Park and not placing a skate park at Lion's Park - he posted at least 8 blog entries on his "little newsletter" in the past few weeks, posted innumerable comments of the various Daily Pilot blogs under several of his pen names and his own, too, and had a commentary published in the Daily Pilot on the subject yesterday - failed to speak on these issues last night. In fact, I don't know if he was in attendance or not, which is also very strange, since he almost never misses a meeting in this city. Perhaps he felt his "direction" to the council had been clearly stated and his ideas were a slam dunk - which it turns out they were. Costa Mesa politics is a strange business. It was good to see Katrina Foley back in the saddle after her recent convalescence from cancer surgery, about which she spoke briefly at the beginning of the meeting. She brings focus to the debate of most issues. Perhaps that's why our young jailer/mayor looked like he was dealing with a bad toothache all night. So, every tree hugger in our town can breathe a little easier today because the insects, birds and other critters in Fairview Park have been given a reprieve. And, the skateboarders in our city - who waited a generation for the first skate park - will have to wait a little longer to see just how the City Council will resolve their frustrations and pent-up demand for more skate facilities in our city. Based on some of the testimony against a skate facility in Fairview Park and the photos presented by some speakers, I guess those little "terrorists" will just have to continue damming up the flood control channel to make a skate venue and using every wall, curb and raised planter in the city as a grind rail while they wait. On the brighter side, the council did direct staff to aggressively pursue the possible acquisition of the recently abandoned Air National Guard site behind TeWinkle Park. That process is in it's early stages, but could provide some interesting opportunities for future open space/recreational facilities. Actually, that site has lots of possibilities. Things that immediately come to mind include another much needed high rise senior living facility similar to Bethel Towers on the Westside, more athletic fields like The Farm Sports Complex or maybe just acquire the space, then swap it with another land owner for a site or sites elsewhere in the city where recreational venues are in short supply. Heck, maybe one of those "nasty, polluting businesses" on the Westside Bluffs so reviled by the "improvers" in our city would want to swap - that could be fun. Life is never dull in Costa Mesa. 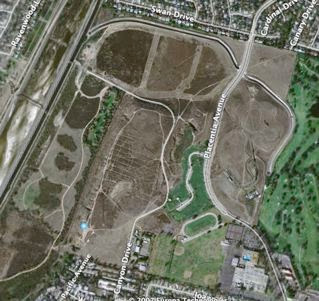 Tomorrow, November 6, 2007 (contrary to a date shown on another local blog) the Costa Mesa City Council will consider several issues that may determine the configuration of Fairview Park in the future. 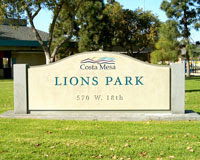 Fairview Park has been described by many local officials and activists as Costa Mesa's "Crown Jewel". As you can see in the photo above, at more than 200 acres, it is the largest open space in our city and the only really "natural" park. Many residents want it to remain as it is - more or less natural and a place where one might go to contemplate wildlife or - one's navel - depending on how you are inclined. Presently, you can ride a choo-choo one weekend each month, fly model airplanes or kites or just meander around through the weeds (native plants) and enjoy the fresh air wafting up the Santa Ana River. What you cannot do is break a sweat. On the agenda tomorrow night, in a curious bit of scheduling, are four items the council will include in it's deliberation. The first on the schedule, Old Business #1, is the consideration of placement of a temporary 2,000 square foot building on the east side of Placentia Avenue, near the model trains. Theoretically, and based on the staff report, this will temporarily house an extremely valuable model train exhibit that may be, at least temporarily, donated to the park. Old Business #2 is the consideration of awarding nearly $70,000 for the conceptual design for a skate park at Lion's Park. I'm trying to figure out why we would spend that kind of money before a decision has been made to consider only Lion's Park as the preferred venue. Old Business #3 addresses the request by Council Member Linda Dixon to consider the closure of Park Avenue north of 18th Street - adjacent to Lion's Park - to facilitate use of Lion's Park for a skate park. Quite honestly, this is a pretty hare-brained scheme, one that would create inconveniences and safety issues since the fire station location is included in the proposed closure area. New Business #2 is the consideration of opening the Fairview Park Master Plan for consideration of inclusion of a skate park and/or dog park within it's boundaries. I've read the staff reports on this issue and it certainly seems reasonable to consider a skate park and a dog park on the east side of Placentia. It seems to me that we've got the cart before the horse, schedule-wise. I hope the council will c onsider the New Business item first and resolve that question. If they decide not to re-open the Fairview Park Master Plan to consider placing a skate park and/or dog park then the other items mentioned above should be given serious consideration. If they do decide to re-open the Master Plan, then Old Business #2 and #3 are premature. There's no reason to spend $70,000 for a conceptual design if the skate park may not end up at Lion's Park. The same applies to the consideration of closing Park Avenue. I fully expect there will be a large turnout for this particular meeting. There will be many views expressed, and much wailing and gnashing of teeth about destroying Fairview Park with cement and buildings. Hogwash! Fairview Park is huge, with plenty of natural areas to enjoy on the west side of Placentia Avenue. The east side already has the model trains and the inclusion of other more active entities would certainly seem to be appropriate. One wag has gone so far as to recommend closing Placentia Avenue, a pipe dream which certainly doesn't make any of the local commuters happy. Fairview Park is a unique and wonderful resource for our city. However, it certainly doesn't serve enough residents in it's current configuration. I've studied the staff reports and think there is plenty of space for a skate park as envisioned, plus a new dog park and the model train building on the east side of Placentia. I encourage those of you who have strong feelings one way or the other to attend the council meeting and voice your opinion. The rest of us may be watching on Channel 24 - the proceedings begin at 6 p.m.